My male lab is not nuetered, is about 75-80lbs and is 1 1/2yrs old. 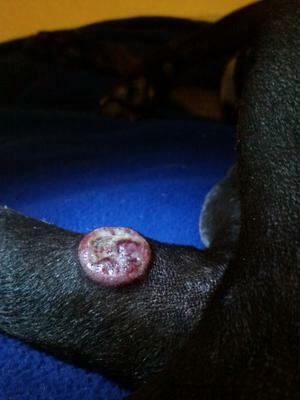 He got this red lump on his inner right back leg He kept licking it and the bigger it seemed it would get. Nnow he still licks it but when u look at it , it almost looks like maybe he has been eating at it . It looks like it might be infected ...also today i noticed he seems to be developing another lump on his chest . What is it and how can i treat it? 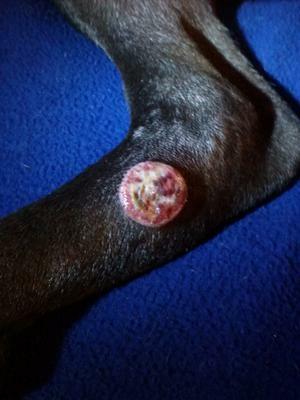 It is impossible to say exactly what the mass on your dog’s leg is without first examining him and probably taking a sample of cells from the area and looking at them under a microscope. This inexpensive procedure is called a fine needle aspirate and is relatively simple for a veterinarian to perform. It won’t lead to a definitive answer in every case (sometimes a biopsy is necessary), but I supsect it will give you and your veterinarian the information you need to make a diagnosis and come up with a treatment plan. It is possible that your dog has something called a histiocytoma, a type of benign tumor that is commonly seen in younger dogs, but other conditions including infections, a foreign body lodged in the skin, and even a cancerous growth are all possible. The sooner your veterinarian can get a look at this and begin treatment, the faster it should resolve and the lower your overall cost of treatment will be. 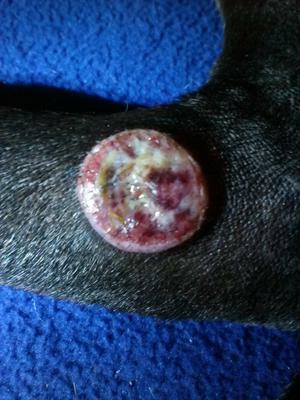 My dog has something exactly like this and she also has a lump underneath her skin! Did you ever find out what it was?